Well be trying out a new way for people to tour the building with a set route and volunteers on hand in each area to answer your questions and tell you all about the history of this unique internationally recognised heritage facility. >Helping with tours of the baths. Or perhaps you think there are other skills you could offer – if so, please email us at events@friendsofmrb.co.uk to let us know what you can do! Even if you cant volunteer for the next open day on March 5th, come along to the event to look round the building and experience the event! We will also have other regular open days during the year so get in touch if you think you could spare some time at a later date. 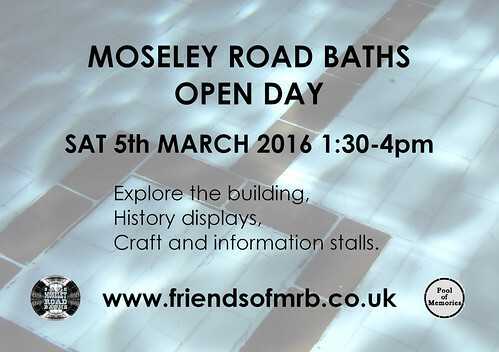 In addition to the Friends of Moseley Road Baths own stalls, Balsall Heath Local History Society will be present and there will also be a craft stall displaying items produced by local people.